I took a long afternoon nap and I knew, from the moment I woke up, that I had done a mistake. I knew I was heading for a long sleepless night, so I decided to make something worthwhile of it and, since I was in no mood for work, I decided to play with fire (literally). Why I picked up these settings? Well at 200mm you can expect the DOF to be thin and focus will fall out very quickly so I needed a relatively high F number to keep everything in focus including the flame and smoke. I also needed a high shutter speed to freeze the action when the match is picking up fire. If it was a one match setup the speed light would have probably been useless but, in my cases, I needed something to light the matches and I doubt the fire light alone would have done that. First, since I was playing with fire, I wanted to take some safety measures so transparent the plate is filled with water in case a match falls or anything. 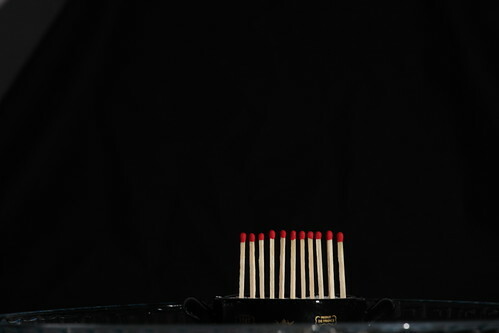 Second I needed an easy and fast way of lining up the matches, so I used a small recipient (the black one) and filled it with salt. Of course sand would have been great but it was past midnight and salt did a great job. I set everything on a black piece of cloth that is used for background, and set my flash on the right one meter away, finally all I had to do was plug the matches in the salt. I started by taking a few shots to get the flash settings right and this is a full picture of how it looked with all matches off and speed light power set to 1/64, I was satisfied with the results. The rest was easy… Set the camera to continuous shooting and used a remote trigger. Basically the camera was shooting continuously from right before I lit up the first match till everything was off again. There is no editing done for the picture apart from square cropping and sharpening, other than this it is straight out of the cam. I often measure my shots by my frustration level, basically how many times I had to shoot or how long it took me before getting the shot I wanted. Well, in that case, the frustration level was pretty low. 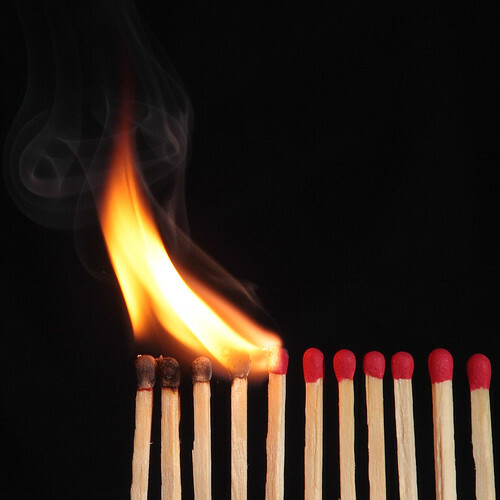 I actually shot only 3 sets (a total of 36 matches burned) then picked up the picture I liked the most cropped it, sharpened it and the job was done. I could have easily picked 5 or 6 others out of tonight’s shots but I guess I will stick with that one for the moment. The concept is very inspiring. Great and detailed instructions, too.